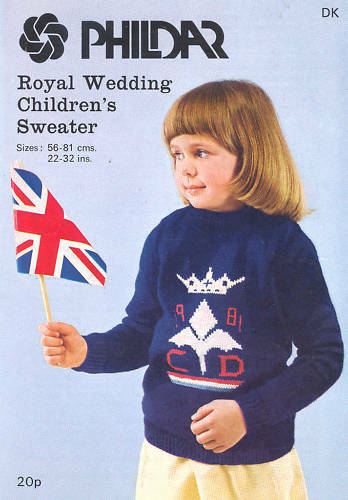 The Royal Wedding: But Of Course We’ll Knit | Knit Like You Mean It. The book "Knit Your Own Royal Wedding" includes instructions to knit the happy couple, their wedding party, and their families - even the corgis. People, I am torn about the Royal Wedding. I remember my mother waking me up to watch Charles and Diana get married; I remember lying at the foot of my parents’ bed to watch, and being surprised by the long, long train of her dress. It was a moment in time for me, maybe the first shared cultural moment I can remember. [The next one might be Hands Across America. Oh dear – the 80s.] And, because it’s a memory of my mother, it’s an especially precious memory lately. Folks have been asking me about this. I’ve spent the past two summers in England, and Mr. Trask and I are getting ready to move there in the fall. Like any good Anglophile, I am not uninterested in the monarchy (To critics, I say three words: The King’s Speech). On the other hand, I can’t get myself to care too much about William and Catherine. They seem like nice people (though some commentators have pointed out that ne’er-do-well Harry makes for better headlines). As speculation about their wedding grew over the past few years, I was interested in that. All signs point to me being one of those people who are camping out in front of Westminster Abbey right now. So – why not? Wills and Kate have certainly inspired better knitting patterns than Charles and Diana did. Now, we’re seeing the clips again, but they’re meant to represent what they originally did – the fairy-tale of princes and princesses, of the trappings of a fancy wedding. I’m having trouble making the leap. Seriously, I want to. I’m just having trouble. I’m sure part of it, too, is that I’ve had my own wedding. I know how the day flashes by, and how the outside trappings aren’t nearly as important as the person with whom you’re going to spend the years that follow that day. Every day, I am grateful for Mr. Trask and our entire history. I do not feel the same about my wedding dress, pretty though it was. Like I always say, knitting can fix almost anything. The impressive “Knit Your Own Royal Wedding” gives knitters instructions to knit the key figures in the wedding (including my favorites, the corgis). This British knitting group has knit the entire thing, and they’re having a party to celebrate (also to watch the wedding). There’s a knitter in the UK who knit a wedding cake for Wills and Kate – though this article complains “it’s not even edible” (what, most knit creations are?). I’m most excited about Franklin Habit’s “roommate,” Harry Bollasockyarn, who Franklin reports was invited to the wedding. Harry and, er, fiesty sheep Dolores Van Hoofen (who stowed away under someone else’s seat) are tweeting from London about the wedding, even now. Franklin Habit makes everything fun. Royal Wedding Yarn: NOT being given away, I'm afraid. Sorry! Here’s what really put me over the edge, though. 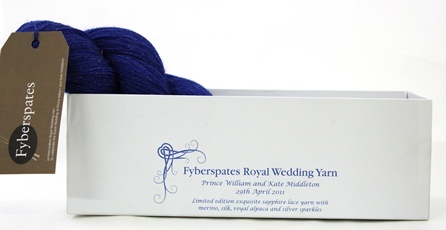 Glorious Fyberspates – an awfully nice British yarn company – has put out a Royal Wedding Yarn to commemorate the great event. It’s the deep blue I love best. It has little silver sparkles in it. It’s made of merino, silk, and royal (ha!) alpaca. I heard about it on the day I heard we were moving to England. This day was just a few days before my birthday. I had just watched Franklin’s video about what non-knitters give knitters as gifts. It was a perfect storm, I’m afraid. The yarn arrived a few days ago, and I’m winding it tonight. Tomorrow morning, the yarn and I will get up early, and I’ll start swatching for Hannah Fettig’s Featherweight Cardigan (rav lnk). What the heck, right? Plus, if I sleep in, there’s always TiVo. 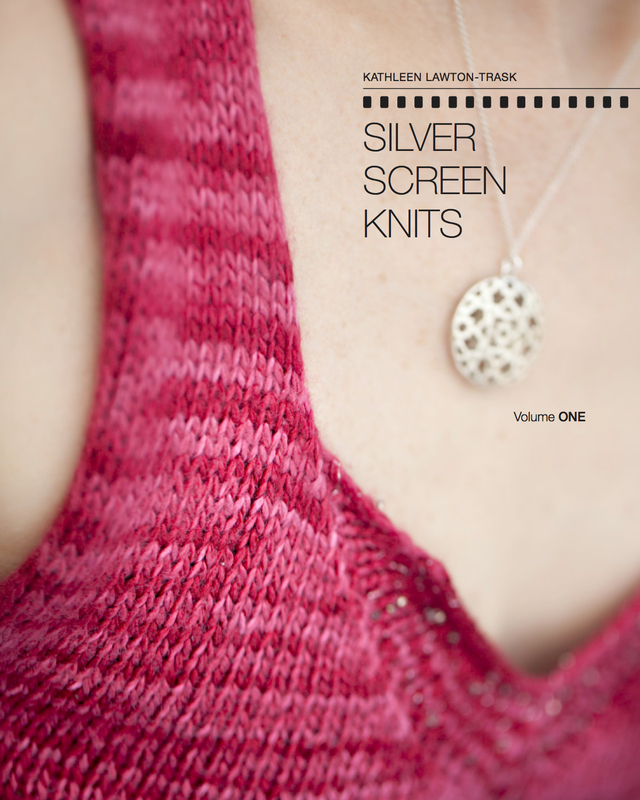 ← Knitting Onstage: With What Results? Did you sleep in or watch the wedding live? I settled for (non-stop) media coverage in the evening – that was enough. And my dear stash-busting friend, did you really buy more yarn?